Everyone lacks productivity every now and then, either because we’re overwhelmed by specific challenges or because we’re stressed out by the number of responsibilities we face every day. Sometimes, we just catch a bad day and we simply can’t focus on our tasks. That’s why great companies like Google, for example, came up with this innovative and effective workplace culture that has proven to be a great productivity booster. More exactly, we’re talking about an animal-friendly work atmosphere in which employees can bring their pets to work. Of course, the little companion must meet certain criteria first. Nothing exaggerated, but yet important for everyone to be safe and sound at the workplace. With no further ado, let’s have a look and see how dogs boost work productivity. Stress and productivity are two things that will never go along. The more you decrease your stress levels the more productive and engaged you’ll be at work. 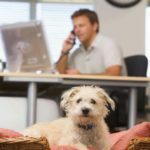 Now, how can the possibility of bringing your dog at work help you decrease or even eliminate the stress factor? First of all, many dog owners are stressed out at work because their furry friends have to stay alone in the house for too many hours. Having your furry little child with you can be a great stress relief for many dog owners. Secondly, petting an animal is well-known for releasing stress-reducing endorphins, aspect then will instantly help you calm down and focus on your task. Therefore, having your dog with you at work will keep you sane and whenever you feel down all you have to do is to ask for affection from your best friend. This is exactly what you need to boost your productivity at work. Most people believe that breaks are a waste of time and that they have to work continuously in order to have a great yield at work. Well, they couldn’t have been more wrong. Why? Because a normal person is not able to keep its focus longer than approx. 20 minutes. So, if you want to boost your productivity, you must take a lot of short breaks, and your furry friend can be very helpful in this way. A dog constantly seeks your attention. If he’s well educated, he’ll help you experience a more relaxing short time-off. You’ll be forced to take breaks, not that it wouldn’t be a pleasure. Animals in general, but especially dogs, give owners a big chance of developing special rapports with one another, of course, if they at least have a sympathy for animals. 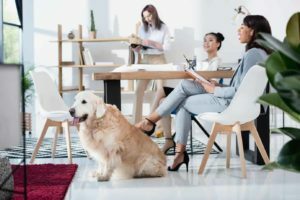 By allowing dogs in the workplace, the employees will find that connecting with one another is much easier, an aspect that promotes an effective team-work dynamic. People find it easier to accept other persons in their life if they share a common passion, especially if it’s something like animal love. Therefore, they’ll be able to work better together than if they had nothing in common. And, if they are more efficient working together, they will also be more productive. Simple at that. Usually, persons who are practicing any type of sport or who exercise in any way on a regular basis tend to be more productive. If you have a dog, even if you want it or not, you must play with him daily as he must consume his energy. So, if you take your dog with you at work, you’ll most probably walk him to the workplace and hit two birds with one stone. Walking with a dog is a great morning exercise, exactly what you need to boost your productivity over the day. Everyone knows that having a dog is a great responsibility. Now if you want to take your friend at work with you, then you must double the trouble. First, you must ensure that you have trained your dog well enough, so he will behave properly in the workplace and will always respond to your orders. Taking a responsibility as huge as taking your dog with you at work implies that you’re in full control over your situation. Therefore, the opportunity to be 24/7 with your furry friend will motivate you enough to be more productive than ever. Working in a pet-friendly atmosphere is a great productivity boost. Animals are filling the place with good and happy vibes, and who doesn’t like to come to work in such an atmosphere? As well, if your employees happen to be dog owners, then you’ll know that you have to deal with responsible persons. So, let me ask you, how can you not be productive in such a loving and mature environment? 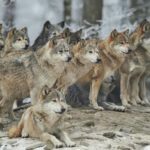 Another scientifically proven benefit of bringing animals at work could be crucial to some professionals. 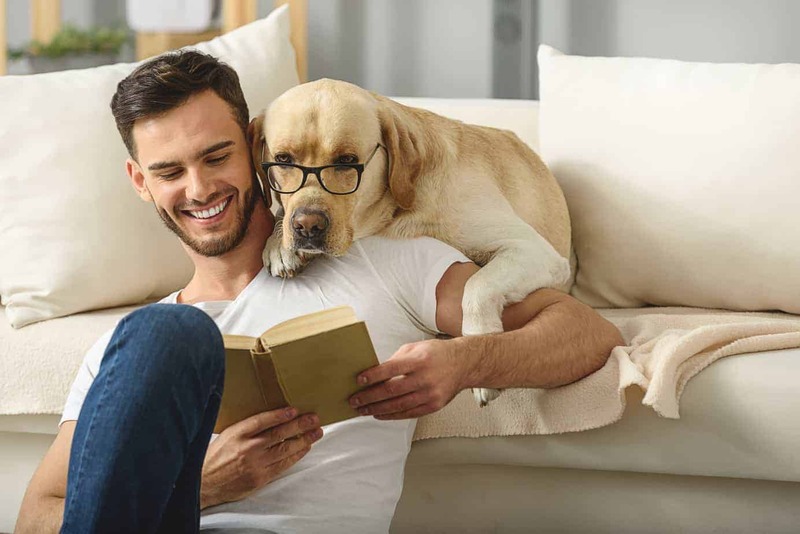 For those who have to regularly use their creativity to solve tasks, having their loved companion sitting close to them during work can improve their creative juices and ultimately their overall productivity, these aspects leading to an increased workflow performance. 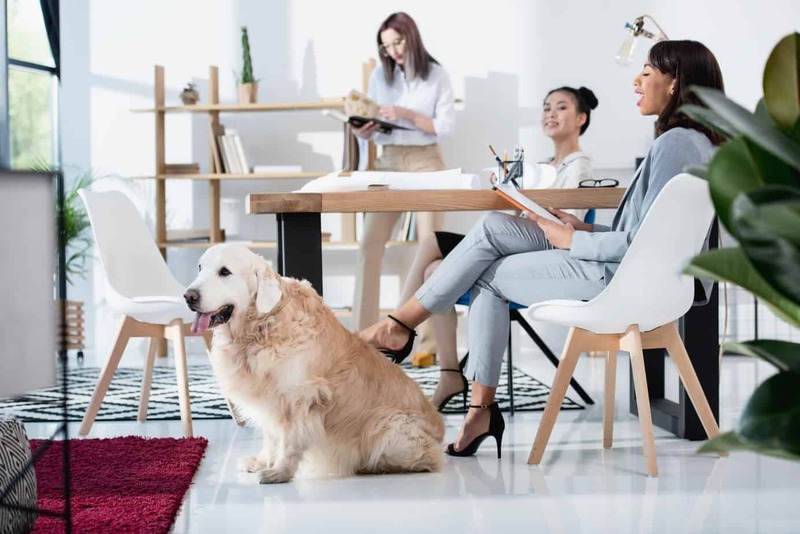 As you might have figured, allowing your dog to sit side-by-side, real close to you whenever you have to work will bring you real benefits. If you’ve never tried it, now you have the chance to build enough courage and simply do it. 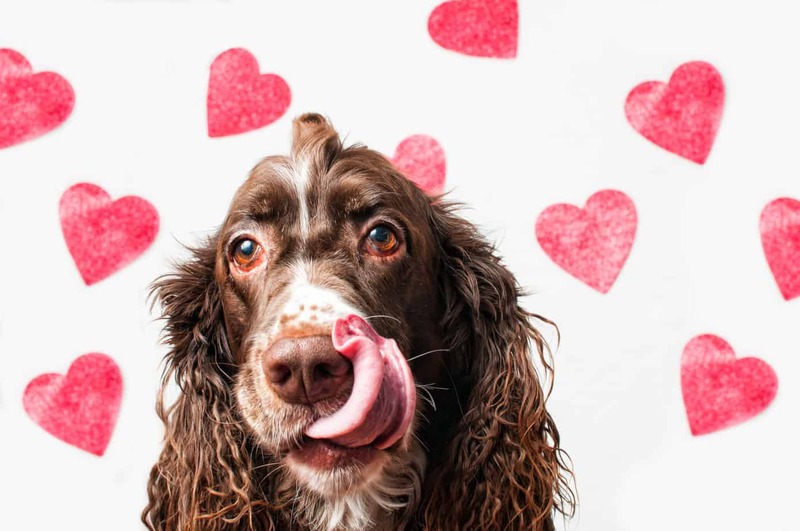 Reap the benefits and thank your dog later! Jacob Dillon is a professional writer and journalist from Sydney. Being passionate about what he does, Jacob likes to discuss stirring events as well as express his opinion about technological advancements and evolution of society. Follow Jacob on Twitter and Facebook.